Yes, Thanksgiving is over and it's back to work for just about everyone. 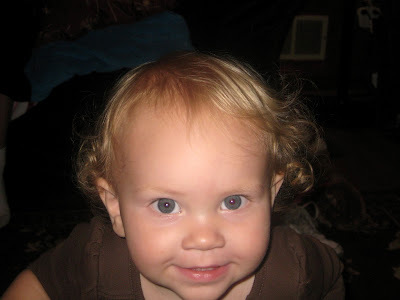 This is a hilarious picture of Savannah. I don't know exactly what was going on - but she had her arms and legs going every which way. 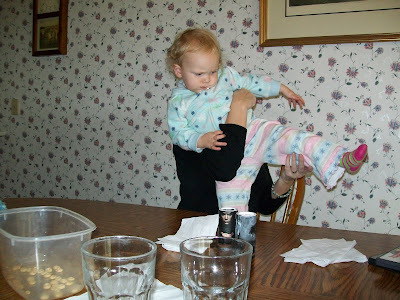 I laughed when I saw this one, because she is in a death-defying armlock to keep her from vaulting over the dining room chair. Ha! I am off to aqua-cize class shortly, so I don't have time to write more! Day 1379 - Onward to Christmas! Here is Miss Adorable, eating scrambled eggs with a real fork! What a big girl! She's so cute that it's impossible not to stare at her every minute. I am already making preparations for Christmas. I've put out the wreath on the front door, and taken out the other indoor Christmas wreaths. Charlie has put up the artificial tree, and I need to 'arrange' the branches before I decorate it. Another thing I need to do is DIET until Christmas - I stepped on the scale this morning and can't possibly blame that number on water weight. 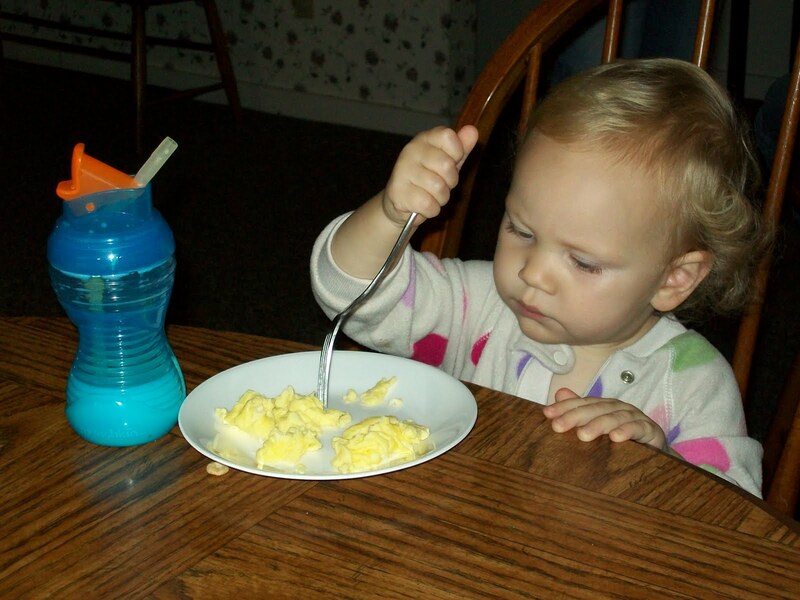 However, I'm craving a bologna sandwich for breakfast, and maybe a side of hard boiled egg. Just a quick note before breakfast is ready. I had a wonderful thanksgiving, and judging by my puffy ankles last night - overdid my sodium limit. I had second helpings of stuffing, and had more stuffing for dessert later. We are off to the airport soon, and back home to Nashville. Hugs and kisses to all the family we got to see and share Thanksgiving with - we had a WONDERFUL time. Day 1376 - Happy Thanksgiving! Just a quick note to say 'Happy Thanksgiving'! 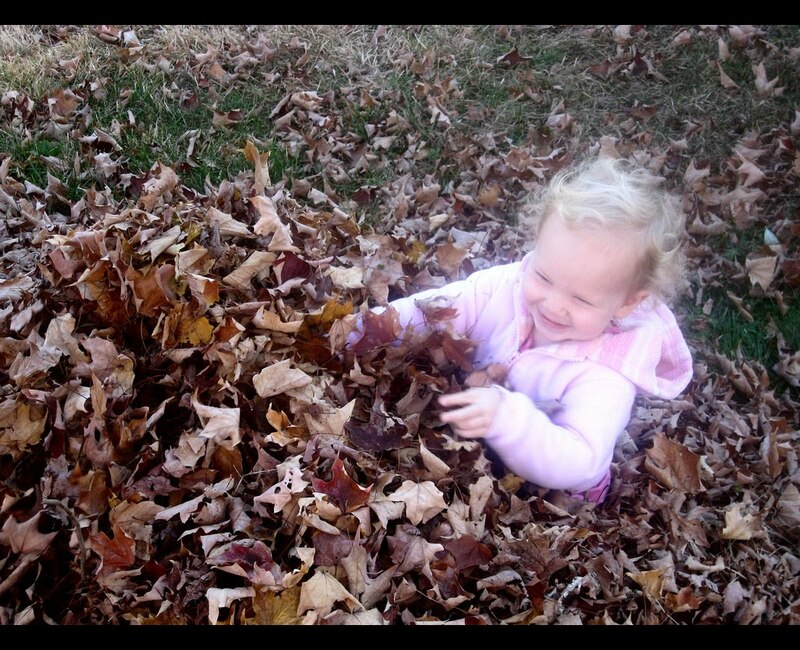 Here's a photo of a little darling that I know I'm thankful for! We ALL have things to be thankful for, don't we? Look how excited Miss Savi is about Thanksgiving. Okay, it wasn't about Thanksgiving but I can embellish, can't I? Today, many many people start cooking. Today, many many people start travelling. Today, many many people start over eating! For me, knowing that tomorrow is Thanksgiving makes me twice as hungry! Does it do that to you? If you're hitting the road, have a safe and wonderful holiday. Enjoy it, because it's all about Christmas after that! Day 1374 - Where's the food? Where's the GROUND? Greetings, Bloggy 'Is Thanksgiving EVER going to get here' readers! I need to pause in my daily food journals and talk about these little flags on the hydrants in Maine. No - they are not just cute. Do you know what purpose they serve? 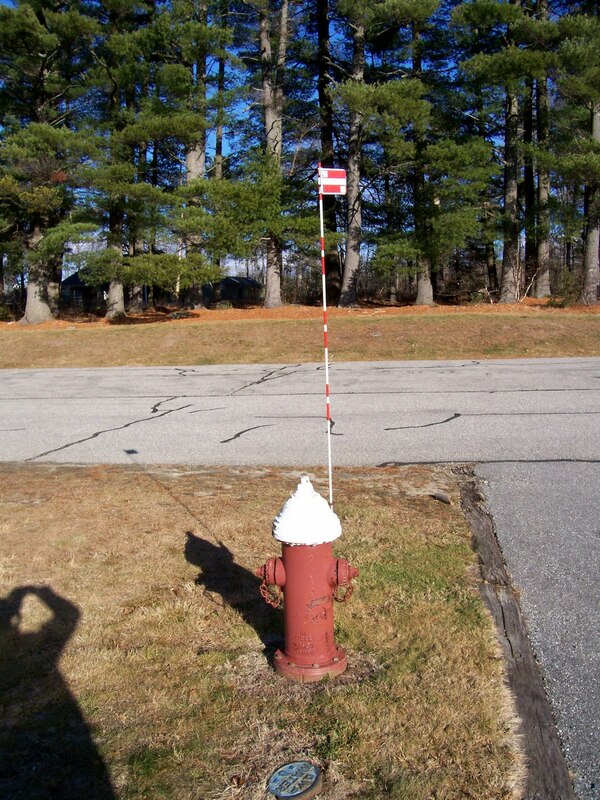 You've got it - it snows so much that the hydrants are completely covered, and the flags give the crews a marker so they can dig them out! Conservatively, you can have about a 6 foot snow and still be able to fight a fire. Be safe and watch for snowstorms! TTFN! Equal parts of gravy and food sounds about right to me. No, I don't buy gravy at the store for Thanksgiving. It's too important! Yes, I make my own stock by roasting a turkey and then boiling down all the remnants (with vegetables) until there is a delicious, delectable broth. If your broth isn't good, your gravy won't be good. My mother taught me to use a jar and shake flour and water, salt and pepper in it. This mixture is much easier to incorporate into the gravy for thickening, and you can control how much is used and how thick the gravy is. I don't want it thick or gluey. NO - I don't use cornstarch for gravy. Ever. Cornstarch is for fruit desserts or Stir frys. One tip for beef gravy - try adding a teaspoon of unflavored instant coffee to your broth - it gives it a roasty flavor that helps make it even more delicious! One change I have made - I use the Wondra (Gold Medal) extra fine flour for sauces and gravies rather than bread flour. Day 1372 - Stuffing or Dressing? Greetings, Bloggy 'Can't wait to be stuffed with Dressing' folks! 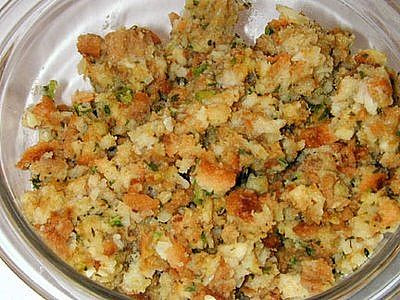 Stuffing is generally a term used up north for Bread stuffing, and is normally cooked inside the turkey. Dressing is generally used in the south, and can be a bread or cornbread based side dish baked in a casserole outside of the turkey. Since they are both BREAD, I like them both, but bread stuffing with Bells Seasoning and lots of celery and onion RULES for me. My mother makes the ultra-traditional and outstanding stuffing recipe that her mother made. I compromise! Her traditional stuffing involves grinding all the crusts of bread and the vegetables (with only a speck of potato for 'glue' - if you use too much potato it will be tacky) into one pan using a meat grinder, and adding butter and seasoning to it. That is incorporated into a separate mixture of the white parts of the bread that has been seasoned and covered with hot water and broth. The two parts together make a fluffy and sensational stuffing. Laura Ingalls - step aside - my mothers stuffing (and mine, of course) rules! Day 1371 - Do the mashed potato! My cousin makes our mashed potatoes for Thanksgiving Day using her mothers recipe. The recipe is from scratch, and uses potatoes, cream cheese, and cream. We all sit around the kitchen table the night before Thanksgiving, peeling and peeling, and talking and laughing. That little floating island of fluffiness, with a MOAT of gravy surrounding it, can only be topped by the 'sister island' of stuffing next to it. Kind of like Prudence and Patience islands in New England, yes? TTFN and ARE YOU GETTING HUNGRY YET? In keeping with the Thanksgiving theme around here - isn't this cute? 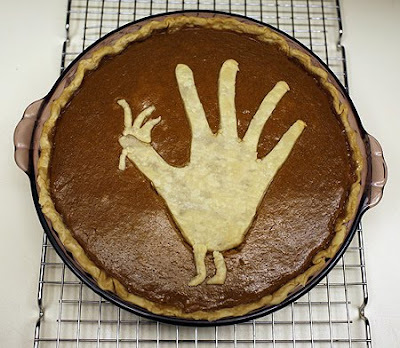 I grabbed it from the web, and it's a cute piecrust turkey, in case your imagination isn't working yet. This is a pumpkin pie - but I prefer to think it is CHOCOLATE. Okay, I'll admit it - I'm not crazy about pumpkin pie. In fact, I can't tell you the last time I ATE pumpkin pie, because I rarely eat it. 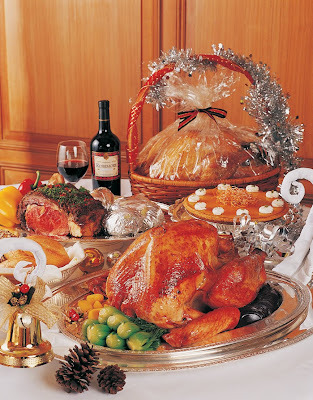 I would go for the apple, the chocolate, the pecan, even the MINCE pie before I eat the pumpkin pie. However shameful it may be - I will go on record saying I will not plan to eat pumpkin pie this year either. Day 1369 - ONE WEEK Till Thanksgiving! One week from today people will be facing the battle of the year - how to cook the rest of the food when the turkey is occupying most of the oven space? Thankfully I never have to worry about that, because I have a turkey roaster. A friend of mine is using her NEIGHBORS kitchen (the neighbor is going out of town and offered!) as an overflow area as she prepares Thanksgiving dinner for 22 people. 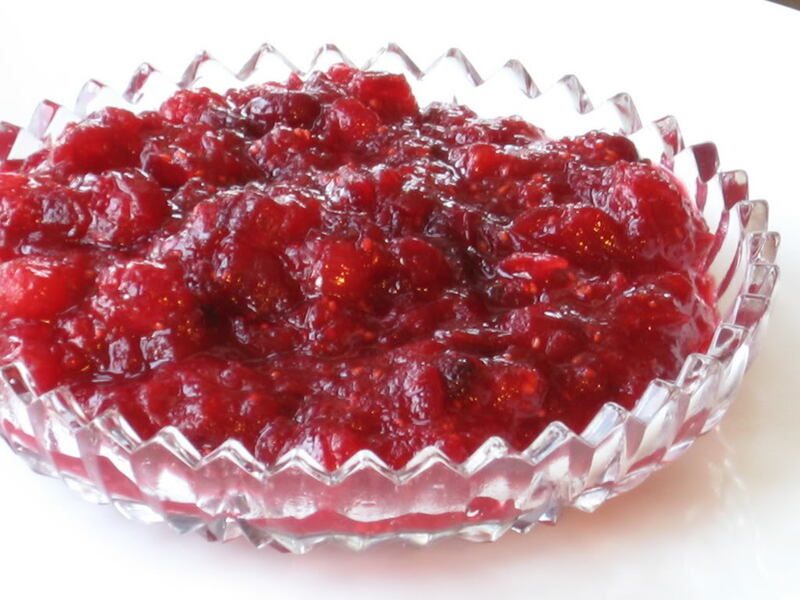 Question of the day - do you make your own cranberry sauce? My sister does! 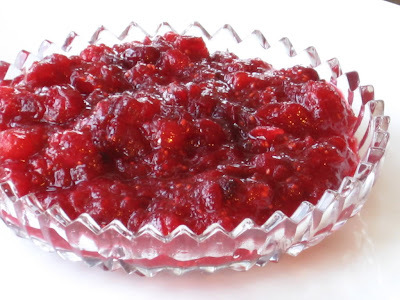 I usually buy it, but there is a cranberry sauce/relish I have had with mandarin oranges in it that is exceptionally good. Once I find that recipe again, I'll make it! I will be daydreaming of Thanksgiving feasts for an entire week. TTFN! 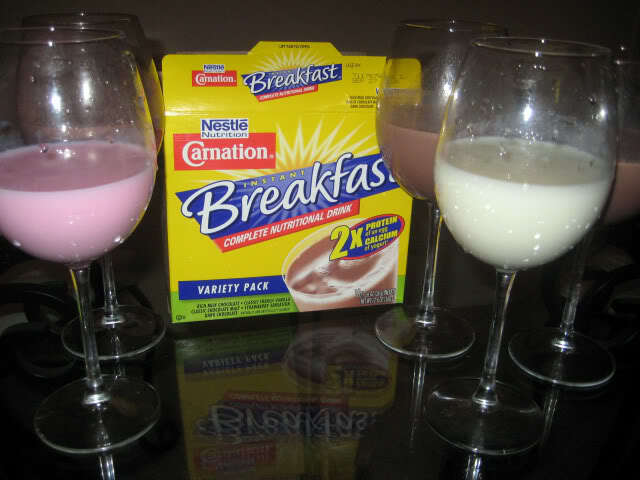 My breakfast of champions or morning wake-up drink of late (instead of a foame' latte') has changed. One milk chocolate flavor Carnation Instant Breakfast with a cup of milk added (or more), plus a lite Yoplait yogurt mixed in, then everything blended like a smoothie or milkshake. It is actually delicious, believe it or not. 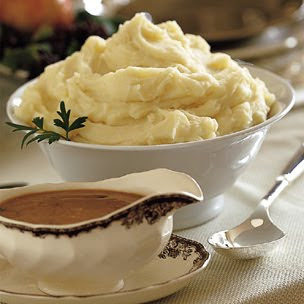 My next big project is also a craving I have - for mashed potatoes and gravy. I'll be working on those shortly. I've decided to make a big pot of them and freeze it in batches in small containers. 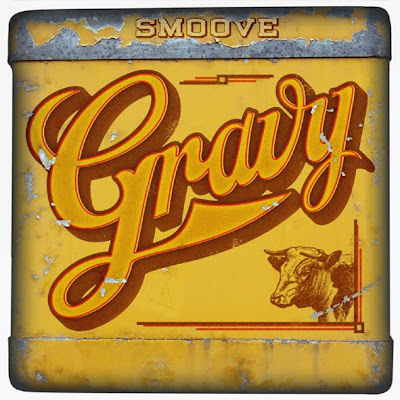 I'll just use gravy from a jar - no time to make REAL gravy at the moment! 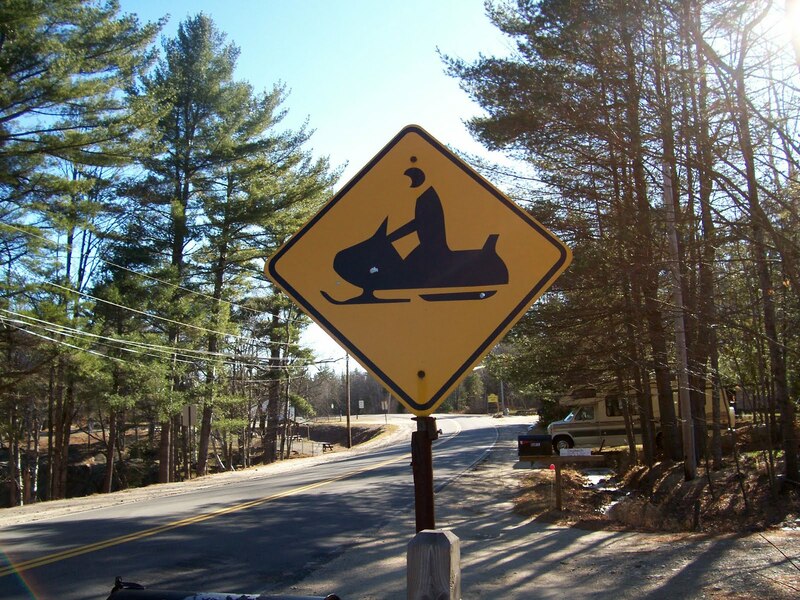 Here's another Maine sign - a snowmobile crossing. I don't think I've even been ON a snowmobile, but I know a lot of people who have, and they say they are fun. I am sick and tired of commercials portraying the most delicious, delectable, double and triple decker burgers and sandwiches, complete with layers of melty cheese, lettuce, tomato, and other accoutrements. In actuality what you get doesn't even come CLOSE to the commercial. I RARELY eat fast food, but the Sonic burger in someones hand this morning (in the commercial) was GIGANTIC - and I doubt very much that it had anything to do with reality. Aren't there rules about that stuff? If you are lucky enough to see a bit of tomato or lettuce on your sandwich, it completely hides the thin sliver of tasteless beef that you actually are served. We tried one of the Burger King dollar doubles recently - and Charlie couldn't even find the second burger. You need a magnifying glass! But of course - the photo in the WINDOW, and the ad on TV makes it look like a feast. Gripe gripe gripe, moan moan moan. I am cooking some cheese grits for breakfast - step away from the burgers, folks... TTFN! Day 1366 - Monday already? 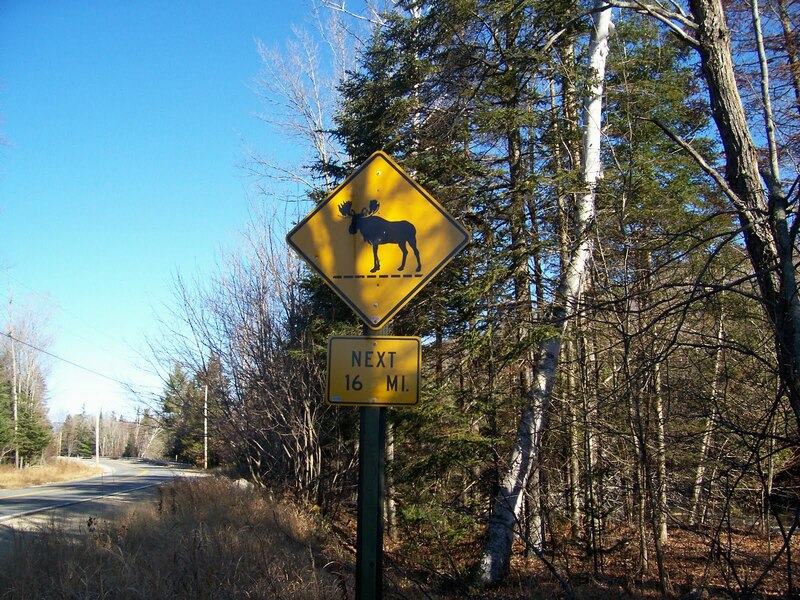 I'll bet you don't see many 'Moose Crossing' signs in Tennessee - do you? I've seen a few Moose in Maine, and they are HUGE! I keep thinking of Maine, and snow, and Thanksgiving, and here in Tennessee (at least until tomorrow when a front comes through) it will be 70 degrees today. Just perfect, in my opinion! Real, freshly made sorghum molasses - Charlie eats this on biscuits. Sweet sorghum is a cane/grass plant that is crushed and the juices captured. Then it is cooked down to syrup or molasses. 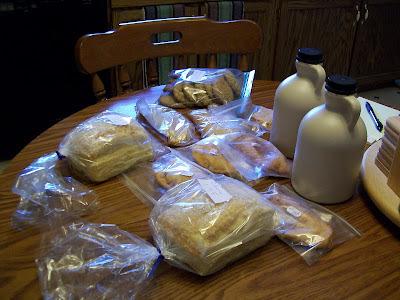 I also bought cheese, bread, pastry, and fried pies. A fried pie is a hand held slice of pie that has been folded over, crimped, and deep fried to heavenly deliciousness. I bought peach, apple and blueberry. Charlie's favorite is peach. My favorite is 'which one is the biggest'? Gotta go! Have a nice Sunday! My friend from work is driving me to Amish country for a visit, so I don't have time to blog this morning. I have Thanksgiving on the brain - can you believe it is almost here? I grabbed this photo off the 'net because it shows both turkey AND prime rib - that is a real treat. Have a great Saturday and TTFN! Day 1363 - Friday the 13th!!! I had all these 'safety rituals' when I was little and had to go upstairs, alone, in the dark. Why is it so frightening to go upstairs alone? I still hold my breath passing cemeteries so I don't breathe in the ghosts. I don't need any ghost debris in MY lungs, thank you very much. 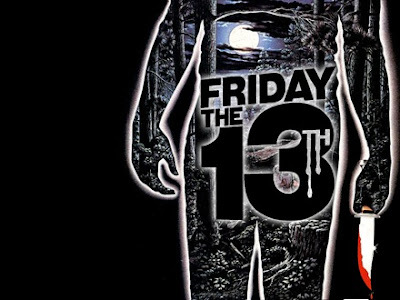 Have a nice and SAFE Friday the 13th! TTFN! Day 1362 - It's Friday Eve already! Here's a picture of me wearing my brandy new chenille hat from our friends TY and SY. I love it! It is very soft and warm. The funny thing is the same day, I bought some chenille fuzzy socks that match it perfectly. THANK YOU, TY AND SY! This needs to be quick, as I will spend half the day today at the doctors and we are about to leave. I wrapped my first two gifts today (just some jam) for the holidays - can you believe it? I am not giving many gifts this year (family, be warned), just gift cards and things like that. Day 1361 - Midweek and MidWIFE! Nothing 'middlin' about a new BABY GIRL in the family. Congratulations to my nephew and his wife on the birth of their baby girl, Sophia. Sophia arrived via stork yesterday. She weighed in at 6lbs, 6oz - and I don't know the other particulars (time, length). Lyn or Mom, can you help with those? Does that make me an aunt, once removed, or a Great Aunt? Sorry for being a bonehead and not thinking that through. I am celebrating by washing blankies - including a pink one. Big celebration, huh? Do you ever feel like your life is full of various 'Convergence Zones', which flow around you like the jetstreams, bringing high and low pressure with them? Am I complaining? Nope, just pointing out a fact that these things all happen at once! 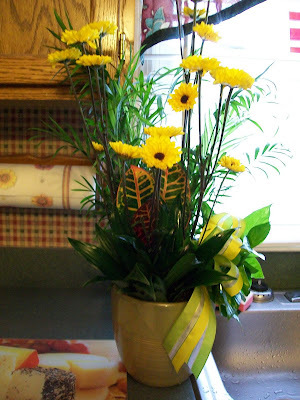 In honor of Monday, here is a picture of the flowers I received last month from my work after my surgery. The inner plants (the fern, pothos and the striped one)are doing fine - the outer yellow cut flowers have gone by and been removed. That reminds me to tell you about my 'ice orchid' - gift from our friends TY and SY. This orchid is both beautiful and actually low maintenance! You water it once a week by giving it three ICE CUBES, which you just set on top of the potting material. Is that cool or what?? Speaking of plants - vegetables are plants too, which reminds me to make a confession. I am finding that the yellow ones with the wax on them are much harder to cut and cost more than the purple and white ones. I actually get cravings for vegetables like turnips and parsnips and squash - isn't that wierd? There must be some vitamin in there I need. Have a nice Monday and TTFN! Heather - I loved the card from you all with Savannah's scribble on it. Thank you! Send more artwork! I am looking forward to lots of refrigerator art from Miss Savannah. My fridge used to have LAYERS of stuff on it, and tons of magnets. It is not quite so populated now, but still plenty. I have a whole suitcase full of Heather and Evan's childhood art - with no clue what to do with it. Any ideas? Take photos of it and gently discard the originals? Vacuum seal it? Gotta go - have a nice Sunday and TTFN! Day 1357 - Car Wash, Yeah! Yes, I did it, for the first time in my life, I got my hair highlighted. AND - I LOVE, LOVE, LOVE IT! I really do - it looks very natural but cuter than my boring pre-highlighted color. I have tried and tried to get a photo that captures it, but the lighting just isn't right. 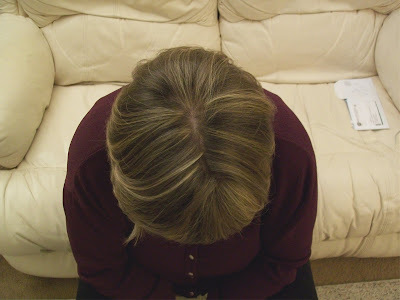 The photo of the top of my head probably is best to show the various layers of highlighting. And the good news - I went to the local beauty college in Franklin to get it done! 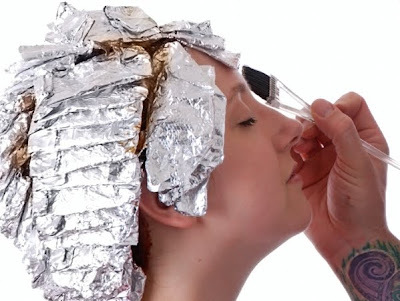 They offer a partial foil highlighting job (I had 20 foils) for $22.50, and a full for $45 instead of $80 up. I had two different people work on my hair - one girl did the highlight job, and another girl washed my hair (complete with scalp massage) and styled it. The second girl was always humming to herself in between conversations, and would periodically burst (and I mean burst) into song - yelling 'Car Wash!' or 'Workin' at the Car Wash, Yeah!' - remember that disco song? She was hilarious - energetic, funny, and laughing. These girls were 20-ish, both of them skinny as a rail with Goth-style jet black hair. I tipped each of them, and I was there for 2 solid hours. Day 1356 - Foiled Again! I have a 9am dentist appointment, then a 12:30 appointment at the hair place to have my hair highlighted - not so many foils as this, just some. Savannah is 20 months old today! This morning's hair experiment - I washed it, didn't dry it, and put some gel in it. We'll see what happens. I noticed something this morning. When I stepped out of the shower I didn't have a 'jet' of water running out of my hair. That is nice... I might actually be able to use ONE towel instead of one for the hair and one for the bod. Better get crackin! Have a nice Friday and a great weekend! TTFN! Day 1355 - Lions and Tigers and Mousse, Oh My! Okay - someone tell me why I need half a million hair products to have LESS hair? 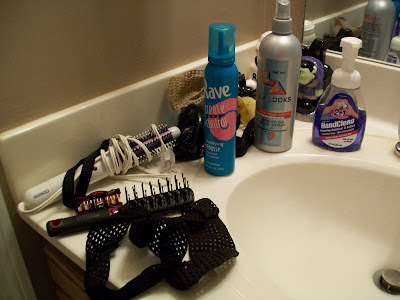 I have hair spray, I have mousse, I have headbands, I have clips. By the way - isn't Mousse the Maine State animal? Ha! I have a plug in curling iron, I have an electric curling brush. Let's see - I have some 'ends' that wave one way - some that wave the other way. If I try to make them all go in the same direction, then I look like I am attempting an afro. If I wash it and start again, they'll wave in a completely different direction. I haven't attempted the blow dryer yet either - I'll end up looking like Peppermint Patty for sure. How can I best compound this hair dilemma? I think I'll go get it highlighted, which I've never done in my entire life. TTFN and have a good hair day! Day 1354 - Rapunzel, Rapunzel - What? No Hair? I don't think this is a very flattering picture of me, but I just have to get over the ego thing. Do I really have a square face, or does it just look like that in the photo? SEE ALL THAT STUFF in my hands? 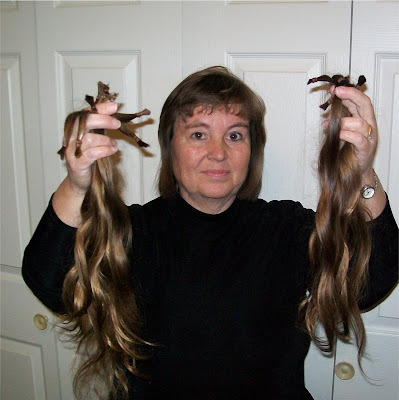 THAT IS MY HAIR! MY HERETOFORE INSEPARABLE HAIR! For the first time since I was a kid, I have short hair. IT FEELS WIERD FOR SURE. I am experimenting with hair clips and head bands to figure out how to fix it without much effort. At first I thought I look like someone wearing a helment made of hair, but Charlie says it isn't that different so I am trying to get over it. I expect lots of sympathetic comments and compliments on my short hair today. You may know we have two horses next door - a brown and white one, and a black and white one. The black and white horse has managed to get out a few times lately. We phoned them one day when we noticed him standing in their DRIVEWAY. Our neighbor stopped over (with the pie) the other day and told us this story about their 2 horses. Of course, the two horses are BFF (best friends forever). 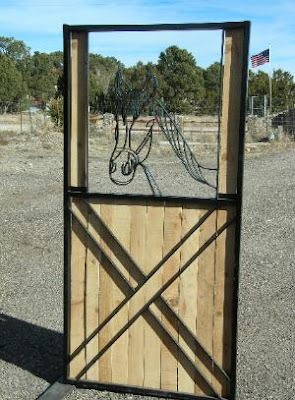 When the black and white horse gets loose, his punishment is to get put in the barn where he can't roam. The brown horse has figured out how to nibble on the stall latch AND LET HIM OUT when he is on 'house arrest'. So - they are in cahoots. The black and white horse misbehaves and goes into 'timeout' in the barn. His buddy comes over after everyone is gone and lets him out so they can play. I think that is the greatest story. I advised they get a video of it for 'Funniest Home videos'. I do, but I can't remember any Zombie COMEDIES. 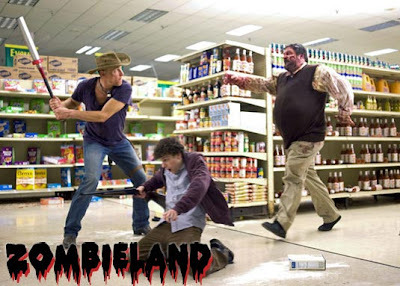 We went to see 'Zombieland' this weekend, and it was HILARIOUS! I highly recommend it IF you can stand the gore of Zombies. It is funny, entertaining, you'll like the characters, and the zombies are appropriately creepy, all at the same time. That's all I've got to say, except the Tennessee Titans finally won a game this year. Woo Hoo! Day 1351 - Happy November! 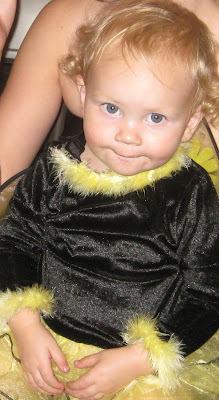 How was the trick or treating last night? This photo is of the GORGEOUS chocolate chess pie the next door neighbor brought over to us yesterday. A chocolate chess pie is similar to a chocolate pecan pie texture, but no nuts. 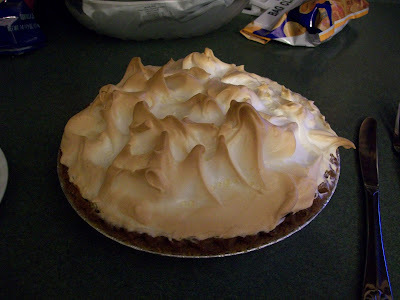 Our neighbor said she'd made another one last weekend for us, but the meringue came out darker than she wanted and she wasn't happy with it. Her husband stood, poised over the 'mistake pie', knife in hand, asking 'Are you going to take it over there or not?' As soon as she said NOT, he was into it... Too funny! Is that the most picture perfect pie ever? Charlie calls it a 'Paah', I can't really write how he pronounces pie. Have a nice Sunday, everyone - the countdown to Thanksgiving is ON!